After living in Vietnam in 1994, Lisa duBusc Miller returns to Saigon in 2015 to revisit old stomping grounds among new sights and sounds. Saigon, Vietnam today was a startling change from the one I left back in 1995. I was just a toddler full of promise when I last experienced its warm embrace. Today it’s like a 30-year-old businessman ready to take over the world at full throttle, and I barely recognized it. Okay, to be honest, I didn’t move to Vietnam to be a capitalist pioneer; I moved there because I was madly in love. Mark was my first real love, so obviously I went to the ends of the earth to be with him. In this case that meant Bangkok, Hanoi and then finally Saigon. So, this part of the world became very dear to my heart and it is how I came to live and work in Saigon in 1994. Naturally, the relationship fell apart after I accepted the job (but before I packed my bags and moved there). So I arrived in that city of steaming hot sidewalks that smell of lemongrass and barbecued beef. I can still hear the clattering dishes and tiny plastic stools scraping against pavement. I can still see the women in silk pajamas shuffling along the sidewalks in hard plastic slippers too small for their feet. It seemed they were always cooking rice and pork, and serving up hot bowls o f pho (Vietnamese soup) day and night, to squatting patrons. It was always mealtime on the streets of Saigon. I arrived with my newly-minted masters degree in one hand, and my broken heart in the other. It was the nineties and I was naïve enough to actually detest all Asian food. I was doomed. I’d disembarked from a Vietnam Airlines Russian Tupolev with nowhere to live, scared, but determined to act tough. It wasn’t easy. I cried a lot. I made a lot of mistakes… like when I decided to buy a bicycle to get around town. After a near-fatal fall in the mayhem of Saigon’s downtown two-wheel traffic, I switched to a Honda motorbike and never looked back. Helmets were never worn, of course, and intersections were (and still are) mind-blowing magic tricks of patience, faith and trust, where eye contact was everything. Emerging out of each one alive was always a delightful surprise to me. And there was no limit to the number of children, friends and family that could squeeze onto one bike. A family of five aboard one was not an uncommon sight. And come to think of it, cell phones were not around either (I counted myself lucky to have a pager). And yes we used computers, but not for surfing the Internet or checking social media. We toiled over spreadsheets projecting the profitability of our work, sweating it out under ceiling fans that gently pushed the hot air around. Monkeys were either underfoot or jumping onto our keyboards. But yes, as industrious as we were, we still napped after lunch, as was tradition. And no, we didn’t wear our shoes inside the house, but yes, someone was always sweeping the stoop. But I found ways to adapt to that bustling city, and in the end I fell in love with its passionate, smart and hard-working people, not to mention its alluring sights, smells, sounds and energy. Delicious French baguette sandwiches filled with mystery meat and cilantro were sold at every street corner, echoing the French architecture of Dong Khoi Street (which back then was the shopping street). 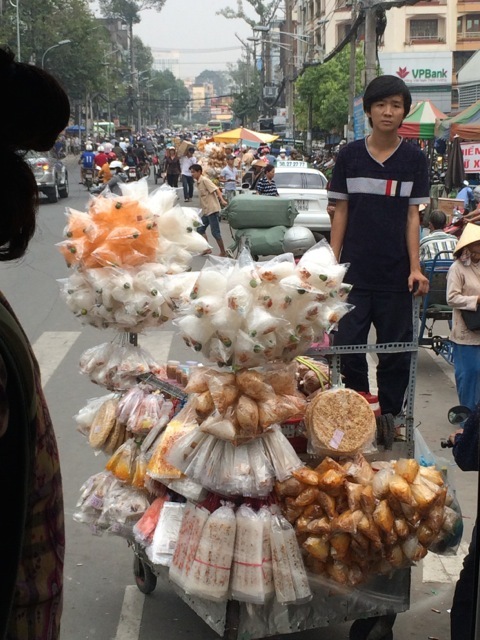 I’d pay for those sandwiches by peeling bills off of rubberband-bound bricks of Vietnamese Dong I’d carry around with me (as the exchange rate back then was about 11, 000 VND to 1 USD). And every night the smells of frangipani and incense would waft to my balcony as my head filled with the language I was learning, like a song that refused to be forgotten, lulling me to sleep. It was all quite intoxicating. In the mornings, I’d wake to proudly make my own Vietnamese coffee with my single-serve tin filter, and eat dragon fruit, jack fruit and street vendor croissants (or mooncakes during Tết, the Vietnamese New Year). I’d then head off to work each morning by enjoying a lovely pantomime with my landlady. She ran a tight ship and reminded me of my grandmother. As soon as she saw me come downstairs, she would stop sweeping the stoop to haul my Honda Dream out of her living room into the alley. She would then grab my sandals and place them beside the bike, pat the seat and smile. She spoke not a word of English and was content to keep it that way. Instead she would say “Co Lisa, Hôm nay em đẹp quá” a lot (which I eventually learned means: “Very pretty.” And I’d say “Cảm ơn nhiêu lầm” a lot, which means: “Thank you very much.”). 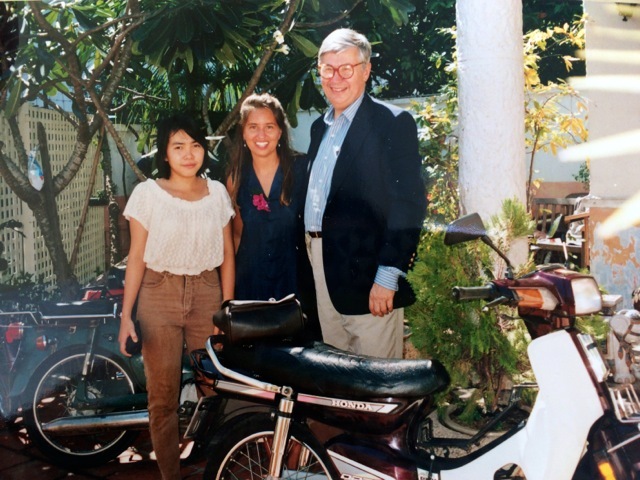 I never taught her a word of English – ironic, as I was there to promote English education – yet her daily smiles and nods of approval helped me learn so much Vietnamese, and I cherished her for that. What I loved most about Saigon back then was that it was truly a neighborhood. Life was happening right out in plain sight on sidewalks, stoops and streets. No one was holed up inside and alone. It was too hot to be inside! Everyone had each other to bear witness to their lives. Curbside commerce certainly created a community, and I felt lucky to be a part of it. 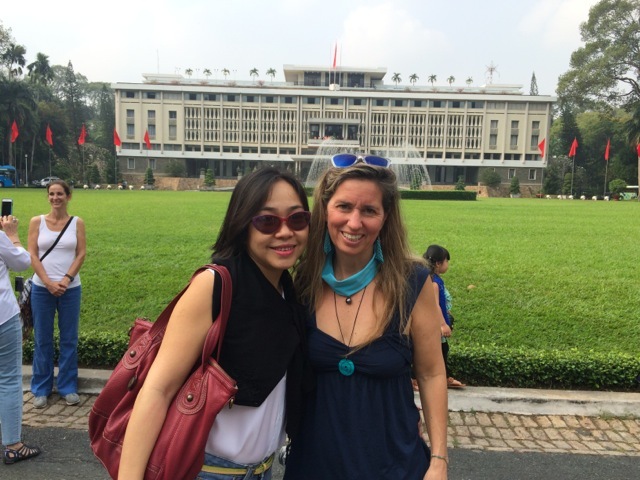 I made lifelong friends in Saigon: Sophie, a British expat, and Thuy Vy, a young Vietnamese lady who I hired as my translator. They are Saigon’s gift to me. I love them and will always love Saigon for giving them to me. As my children know from hearing me say it a million times, “It’s the people that make the place.” Well, they made Vietnam for me. Thuy Vy took such great care of me and she made my job infinitely easier. Sophie taught me all sorts of insider expat tricks, like how to get fabrics at Ben Thanh market to make the most beautiful skirts and ao dai (a Vietnamese national costume). But mostly she gave me confidence that I could survive there, because she had. 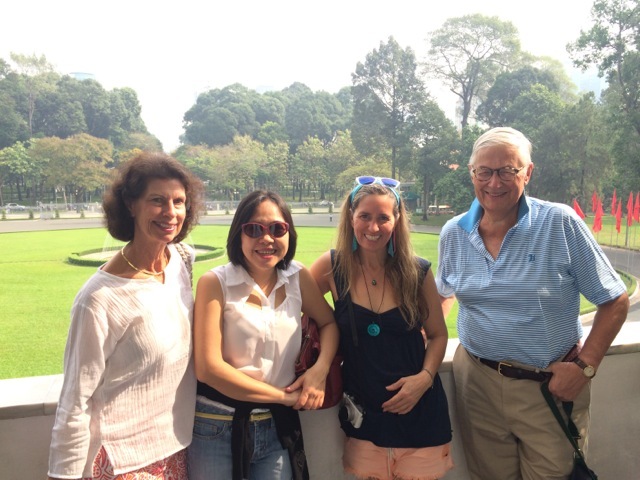 I was also enamored with the close-knit camaraderie of our expat community. Ho Chi Minh City may have been the name imposed on our town, but we expats lovingly referred to it as Saigon, as a gentle nod to its beautiful pre-war past and its more free future. And, boy, did I love what pioneers (lunatics) we all were. Hash House Harriers was our idea of a good time. We’d spend our Sunday afternoons racing each other out in the rice paddies (yes, among unexploded mines) finishing off with outrageous festivities. We were all happily riding the wave of this country’s new race to capitalism, and it was a quite a rush. Only a handful of expats were American and, of those, almost none were women. And I was only 25 years old. Vietnam had truly just begun to open up trade in the early 1990s following the dissolution of its reliance on trade with the Soviet Union. And we were still five years off from a formalized trade relationship between the U.S. and Vietnam. Workwise, I was working for a Singapore company and actually made tangible headway in selling the concept of extra-curricular English language education to the still-very-communist mindset of the Ministry of Education. That was the biggest rush of all for me. So here it is 2015, a mere 20 years later, and I’d finally made it back. This time I landed in a Vietnam Airlines Airbus. And, without much warning, I looked out at the tarmac and burst into grateful tears. The ride from the airport made it clear that this city is so very different from the one I left in 1995. The juxtaposition of old and new had my head spinning. Such progress, yet still so many contradictions. There were so many new storefronts and marble walkways, skyscrapers and Dunkin Donuts, Starbucks, and Popeyes. From Hermes to Domino’s Pizza and everything in between, Dong Khoi Street felt more like Madison Avenue now than the quaint tree-lined French Boulevard of my day. I had known in my gut way back then that all of this was on the horizon, but seeing the reality with my own eyes was something entirely different. We stayed at the Majestic hotel, which was a great choice, overlooking the Saigon River. Our touring included Cholon (Chinatown), a lovely dinner cruise on the river, and the not-to-be-missed Reunification Palace. The camouflage-colored helicopter on its roof was made famous in the April 1975 withdrawal of U.S. troops from Vietnam. 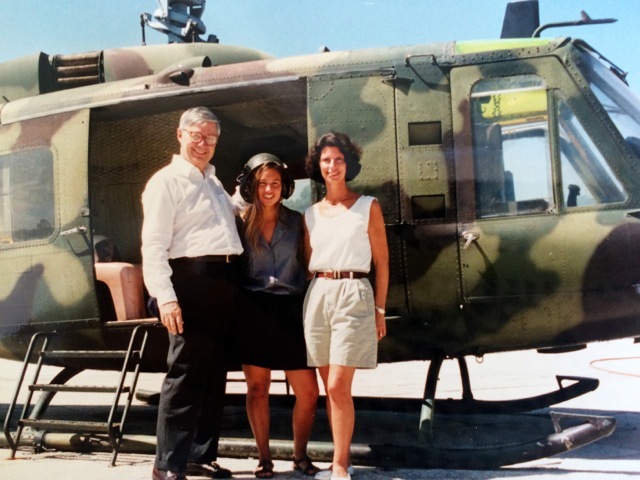 My parents were especially excited to get a picture of us three in front of that helicopter, just as we had done during their brief visit to see me in 1994. It had been a memorable moment of their visit (as was driving my dad around on the back of my motorbike and crawling through the Củ Chi tunnels together). Meanwhile, I searched to find, mixed in with all the shiny and new, some familiar sights of the small town I remembered. And, sure enough, in between the chain stores and brand names, I found some. First we found that tiny German restaurant on Dong Khoi street where I’d soaked up the precious and rare air conditioning with German expats over bratwurst and beer. Secondly we found the site of the old Q Bar, which was the ultimate expat haunt in 1994, housed within the Saigon Opera House. It was where I’d met Sophie and so many other extraordinary and adventurous souls. Then there was the grand old dame, the French-colonial-styled Continental Hotel, made famous by Graham Green’s The Quiet American, still gloriously standing tall among all the construction and progress swirling around it. We then made it up to the Rex rooftop garden. The vantage point from up there was still glorious. It was where I had spent the first night of my life in Saigon, seeking fellow expats and cooler air, which only a rooftop could provide. Now, with the proliferation of air conditioning all over the city, it was merely a way to step outdoors for a moment to view the massive construction site of the new underground subway system far below, on Nguyen Hue. It all left me breathless, and wistful, watching my old neighborhood of Saigon transform into a sleek Singapore-like city right before my eyes. Later, standing on my beloved Mac Thi Buoi street, where the Apocalypse Now expat hangout once dominated the scene, I was flooded with memories of the wild nightlife we had back then, all the while feeling as far out of my element as possible. Now a skyscraper stands tall where Apocalypse Now used to sprawl. I stood stock-still in the street trying to merge my expat memories with my tourist present as I stared up at that skyscraper. My last day in Saigon, Thuy Vy (who had flown down from her home in Nha Trang, where she now lives with her husband and children, to visit with me), pulled out a map and pointed to Phan Ke Binh Street and said that rang a bell to her. I was floored. That was definitely the street I’d lived on! Moments later we were in a taxi on our way up to Phan Ke Binh street to wander in and out of the little alleys off the main road to search for my old Ho Chi Minh City home. Somehow, Thuy Vy and I found it. As I was feeling a wave of familiarity wash over me while studying the number 12/12 above the front door, a man on his cell phone came out of the shadow, asking if he could help us. Thuy Vy launched into her Vietnamese, explaining that we believed I’d lived in that house 20 years ago. He tells us in English that it is his grandmother’s house. At that moment a small Vietnamese lady stepped out from the dark ground floor open space living room, and it was her! I felt the recognition pull all the hairs to attention on the back of my neck. It was actually her, my old landlady, standing on the threshold with that same smile on her face, and those same pajamas. Now I had tears in my eyes, and my throat was so full that it was hard to swallow. Wow. It was really her. I had not expected this. My dad came up behind me to shake her hand. He knew it was the same woman too. She smiled and exclaimed, “Co Lisa!” just as she used to do, and laughed her same laugh from 20 years ago. She held my hands with her little ones, then hugged me when Thuy Vy told her that I now live in New York and have three children. We still seemed to communicate so well with so little being said. We took a picture of us all together and, when we parted, I felt like I’d been handed a huge gift. I really couldn’t believe it. Honestly. That was more than I’d been expecting or even prepared for – to see her again. Twenty minutes later I was sitting at a little coffee shop at the shady corner of Mac Thi Buoi and Dong Khoi streets. I was with my dear Thuy Vy having a café su da (iced coffee with milk) admiring the beauty of Vietnam House, a French colonial building that looked exactly as it did when I left 20 years ago. My departure for the airport was imminent, and I didn’t want to leave. Being back there was too incredible, and this final moment was such a beautiful nod to the small-town Saigon that I remember so well. The smells and sights of the street food were hypnotic, transporting me back in time. Fittingly, Thuy Vy’s farewell gift to me was a bag of the street peddler croissants I’d survived on way back then. I bit into one as I headed to the airport; it tasted like the Saigon of my youth, and there I was, full of tears once again.